Power Assist Wheels are designed to help individuals who are having difficulty with everyday mobility in their manual wheelchair but aren’t ready to use a power wheelchair. 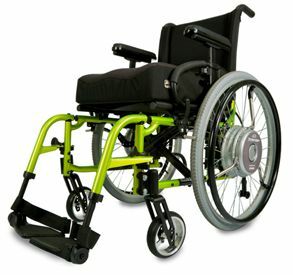 Power assist is effectively a manual wheelchair accessory which includes motorized rear wheels and a battery operated unit mounted to the back or underside of a manual wheelchair. The motorized rear wheels increase the force you apply to the hand rim by up to four times, increasing your range of mobility and reducing energy expenditure. Another benefit of power assist wheels is that the electronically synchronized rear wheel units continually communicate with each other and adjust their speeds to allow for smooth, straight propulsion. This will compensate for those who may have one arm stronger than another. Our certified professional rehab staff (NRRTS/RESNA) at Handi Medical will work with you, a therapist and vendors to provide a demonstration of power assist wheels to ensure the product provides the necessary mobility and function needed for the optimal results.